Camping– for City Folk there’s really nothing like it. A time of rest and reflection, getting away from the conveniences of everyday living. A time for communing with nature while watching your friends light themselves on fire with denatured alcohol. Ah… camping. I’ve been camping since I was a little kid. Yosemite, Lake Oroville, any place with fire pits and a lake. My dad would take us all over the state in a huge state-of-the 80’s motorhome, complete with bunk beds, CB radio, and a microwave oven. I’d feed squirrels peanuts and burn marshmallows and find other kids my own age and create elaborate, meandering tales to confirm my fake identity. Travel of any kind becomes a liminal space to try out new aspects of your persona, and this camp-style storytelling was my way of developing nascent acting skills and the occasional British accent. I’ve camped twice in the past fifteen years, the last time being this weekend. I learned a few things. Around the campfire at Lake Chabot last night I learned that we actually weren’t camping, but “cheating.” It’s cheating to camp with bathrooms and showers of any kind. It’s cheating to have an air mattress in your tent. It’s cheating to be able to hear, off in the distance among the whispering eucalyptus, the BART train making its final runs of the night. We were Cheaters–all of us. This wasn’t camping, according to the men of the group. This was Fake Camping. I also learned last night that I’ve apparently, technically, never camped a night in my life. Real camping is a far more rigorous and ardent exercise of survival, wits, and hygiene. Real Campers sleep on the ground, preferably under the stars, with nothing more than a mat and a bag. Real Campers don’t bring pre-packaged organic salads from Trader Joe’s, or lavender-scented moisturizer. No, Real Campers scoff at that sort of thing, while pulling feathers from their beards from the wild turkey upon which they have just battled and feasted. Real Campers are never cold or uncomfortable. They have extraordinary senses of site and smell, especially at night. And Real Campers never get lost in the woods. They never use GPS trackers–in fact if you hike with a Real Camper he will grab your GPS and throw it to the ground and stomp on it, to save you from being a Cheater. Real Campers hate technology (even if they’re IT managers for Cisco during the week). They create detours using only the positioning of the Ursa Minor and a Swiss Army Knife. Real Campers hunt for their survival. They wait until the dead of night, when the park rangers no longer patrol, to strip naked and smear their entire bodies with mud. 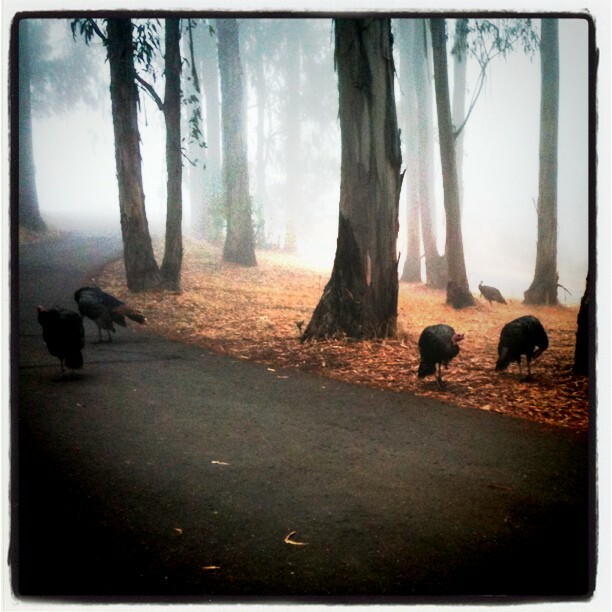 Then they track silently into the woods, mimicking the rustling sound of the North American Wild Turkey. Once the target is spotted, they pounce upon their turkey-prey and wrestle them while tumbling down an eighty-foot mountainside, scaring the poor creatures to their final gobbles of life. To celebrate their food-hunt, Real Campers use turkey blood as war paint on their face to mark their victories, and while throwing their heads back, they roar at the heavens. Thunder rumbles and it starts to rain. But Real Campers are impervious to the elements of nature, so they laugh at the rain and bring their catches back to camp for the ceremonial feast. My point? Real Campers might be a little insane. The point of camping is to have fun in nature with your friends, get some exercise, and cook some good food together. I understand the equating of Real Camping to a core human need for survival: for ruggedness, low-maintenance toughness, to not be lacking while being without. It’s not cool to loofah by the fire. I get it. I guess I accept my Fake Camper status. Yes I can rough it, but for the most part I like being warm, and hydrated, and comfortable during my nature experience. Maybe as a city dweller, I simply have little invested in the self-knowledge to survive the elements. Modernity will provide. I dunno… I think being purposefully uncomfortable just doesn’t sound like much fun. But one thing I do know: I’ll never kill a turkey with my bare hands. Those bastards are huge. It’s the journey of a lifetime: a six week sabbatical spanning Indonesia. After the tactful suggestion by my partner to bring only as much as I can carry on my back, it hits me: this trip is not the order-room service-and-sit-by-the-pool kind of trip. No, this is more of the muddy shoe-mosquito net-you-think-I-have-malaria kind of trip. No gauzy white curtains blowing through our palm-fanned bungalow. No swim up bar with white canvas beach beds. No blow dryers, no flat irons. No heels. A new experience no doubt. Sure, I’ve roughed it before. Back in 2004 I took a surf trip to Costa Rica where friends and I stayed at the trendy eco-friendly (read: gringo) hotel, complete with cement rooms and giant hairy spiders as our silent wake up callers. But we had hot water and outlets, and now, I can’t help but wonder if this exotic excursion is going to push my city girl sensibilities to their breaking point. I can live without heels, and even makeup (I think? ), but not showers. And toilets. There are toilets in the Javanese jungle, right? I have to draw a line somewhere. We’re both global travelers, but my partner, Martin*, is what we call a Rugged Traveler. Before we met, he traveled the globe for eight months, mostly by motorcycle, holing up in dingy hostels and subsisting on local street food. He hiked mountains in India and built ferocious, roaring campfires using nothing but wet toothpicks and a broken shoelace. (Okay I made that last part up but you get my point.) Now, I’m not saying that’s not how I roll; I’ve just never rolled that way before. I’m trying to frame the enterprise as a way to conquer a few fears: fears of uncertainty, intimacy, and caffeine withdrawal (as there will be no Phil’z coffee I am quite certain.) Because this trip will be a test in several ways. Can I travel—and enjoy, I mean truly enjoy—vacationing without my basic creature comforts? And what about us? Six weeks is a long span for a couple who are accustomed to two very different modes of vacationing. Will we bicker, spending so much time together, alone, in a culture we’re both wholly unfamiliar with, or will the experience bring us closer together? Will he object when we get to Bali and I suggest (read: insist on) a much-deserved spa day at the zen retreat I’ve already researched, mapped, and selected massage treatments at? I mean, after weeks of muddy sneakers and street side noodle bowls, a girl should be able to have one measly salt scrub at a hotel, right? With gauzy white curtains in a palm-fanned bungalow. And those curtains had better be blowing.